Australia finally had a moment to cherish after their forgettable series against India earlier this year. The hosts registered an emphatic victory against Sri Lanka in the first Test at the Gabba. Sri Lanka tried their best to put on a fight but Australia proved out to be too good for them. The hosts won the opening Test match comprehensively by an innings and 40 runs. This result must be a great relief for the Australian fans and confidence booster for the Australian outfit. Australia have finally managed to get the balance right after the injury to Josh Hazlewood. Pat Cummins turned the tie in the favour of the Aussies with the ball and took 10 wickets in that game. Cummins gives an edge to the team with his all-around ability to make the balance right for the team. Not only can he torment the opposition batsmen with his lethal bowling, but the right-hander is also a technically sound batsman who can bat at lower down the order and score crucial runs. On the contrary, Sri Lanka will be hoping for a change in their fortunes. The Lankan Lions have never been the same side since the departure of their veterans. Although this is a transformation stage for the visitors, they will be desperate to win and level the series. Sri Lanka have also suffered a setback due to injury blows to their crucial players before the tour began. Angelo Matthews and Nuwan Pradeep couldn’t even make it to the squad which was a huge blow for the visitors. After the opening Test, the likes of Lahiru Kumara and Dushmantha Chameera have been ruled out due to injury whereas veteran Suranga Lakmal's status is unclear because of a stiff back. In spite of all those hardships, Chandimal must be determined to level the series in the first ever Test match at Canberra. They need to put the best put forward if they are to square the series by 1-1. 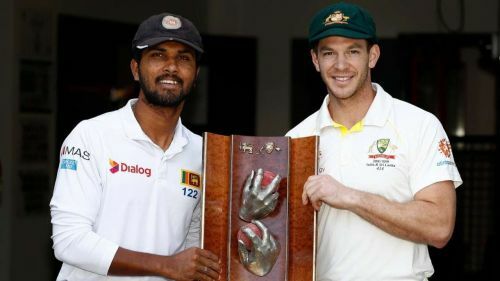 On the other hand, Australia will be eyeing a whitewash over the Sri Lankan side with the same kind of dominant performance in the second Test.